New Delhi, March 25: With the Lok Sabha elections 2019 coming to knocking the door, political parties and their leaders have started accusing each other. 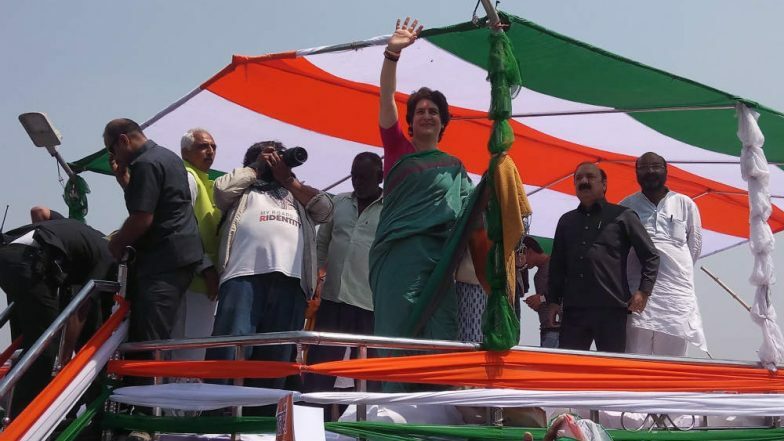 In the latest development, Congress general secretary Priyanka Gandhi Vadra on Monday took a dig at ‘Namo Again’ and ‘Chowkidar’ T-shirts that are being sold as part of poll merchandise. Expressing her opinion the t-shirts being sold, Priyanka Gandhi took to Twitter and wrote, “BJP leaders are busy marketing T-shirts, if only they could pay attention to those suffering.” Lok Sabha Elections 2019: Will Priyanka Gandhi Atone Congress’ Sins in Ayodhya, Asks BJP. It is to be known that hundreds of ‘shiksha mitras’ have been protesting and pressing for better pay and appointment as assistant teachers in the state. In the meantime, the ‘NAMO AGAIN’ T-shirt is being marketed on the NaMo App. Through this mobile application promotion and sale of such article, with tweets and re-tweets of those posting their picture with items purchased can be seen. This started in September last year and since then has rolled out several items such as coffee mugs, stickers and T-shirts. Recently, ‘Main bhi Chowkidar’ T-shirts have also hit the stores.